The age long controversy in the management of thyroid swelling centered around the satisfactory treatment on one hand and the definitive morbidity associated with extensive surgery even in expert hands on the other. The strategy of management is formed after a detailed history taking, a thorough clinical examination, biochemical assessment, ultrasonography and fine needle aspiration cytology (FNAC), scintigraphy, and estimation of tumor markers. The battery of investigations suggested by the researchers was aimed at providing a standard protocol for identification and management of cases of thyroid swelling for surgical removal and also for those patients who refuses surgery on the ground that these are asymptomatic. An attempt was made to find out the clinico-pathological correlates of the incidentally revealed thyroid swellings and to reach an agreement for diagnosis workup for the accuracy of preoperative diagnostic methods for optimal intervention of thyroid malignancy. The study conformed to the Helsinki declaration. This was a prospective study on 178 cases with either incidentally detected or evident thyroid swelling out of a total of 1264 cases attending the otorhinolaryngology (ENT) outpatient department of MGM Medical College and LSK Hospital, Kishanganj, Bihar during January 2007 to December 2009. The study population was from the hinterland of Kishanganj and its adjoining districts of West Bengal. the patients with either incidentally detected or evident thyroid swelling. ill with other morbidities and non-consenting patients. A good number of cases were referred from other departments and peripheral health centers. The main outcome measures were the clinico-pathological correlates and diagnosis of thyroid swellings that were incidentally observed. Institutional ethical committee approved the study. All the subjects were explained about the purpose of the study and were ensured that the information collected from them would be kept confidential and would be used only for academic purpose. Then written informed consent was taken from each subject. The participants were also given the options to withdraw themselves from the study whenever they wish. The principal investigator thoroughly examined all cases at the ENT department by taking a detailed history, general examination along with a system-based otorhinolaryngological assessment. Special emphasis was given on the onset, duration, rate of growth, sudden increase in size, family history, residence, food habits, history of drug intake and particularly of any irradiation in the head and neck area in the recent or distant past. In female patients, an enquiry was made about reproductive health. After clinical assessment, each of the patients was investigated to confirm our clinical impression as well as to access his or her fitness for general anesthesia for surgery. Complete blood count, bleeding time, clotting time, fasting and post-prandial blood glucose, renal function by serum urea and serum creatinine were assessed. Electrocardiography was done routinely as a preoperative measure. Routinely thyroid status was determined by estimation of T3, T4, and TSH by Enzyme-linked immunosorbent assay (ELISA) method in all patients to know the exact thyroid function status. Fine needle aspiration cytology (FNAC) was done in all cases as an OPD procedure. Other non-invasive procedures were done as required to arrive at the diagnosis. X-ray chest PA view and soft tissue X-ray neck lateral view was taken to see any calcification, or deviation of trachea and retrosternal extension. Following admission, the patients were prepared to euthyroid state wherever necessary; counseling was done regarding possibility of iatrogenic hoarseness of voice particularly to those who by their profession had to depend on their voice. Preoperative indirect laryngoscopy was done in all cases. Blood grouping was done and blood was kept ready in blood bank in case of any eventuality. During operation all operative findings were recorded meticulously and carefully including macroscopic finding, visualization and isolation of parathyroid glands and recurrent laryngeal nerve, status of draining lymph nodes. All specimens are sent to the Department of Pathology collected in a 10% buffered normal saline with proper labeling and histopathological study was done in all the cases for a confirmed diagnosis. In the postoperative period all the patients were examined for any postoperative complication of immediate or delayed in nature and routinely before discharge, indirect laryngoscopy was done to see the vocal cord movement and their position. All the histopathologically confirmed cases were sincerely followed by evidence-based interventions according to the international clinical protocol. The patients were followed up as OPD basis after six weeks, 12 weeks and 24 weeks with noting down the condition of the scar, any discharge or persistence of swelling. Besides looking for any postoperative complications as mentioned above, vocal cord position and movement were checked in all cases by indirect laryngoscopy in immediate postoperative period routinely to exclude any injury to recurrent laryngeal nerve. We also followed up all the subjects for further intervention as an ethical responsibility. All cases presented for follow-up till six weeks regularly. Incidentally, during follow-up at 12 weeks and 24 weeks, the attendance dropped to 80% and 60%, respectively. Those cases came up for follow-up are enjoying good health. Information on thyroid swellings was disseminated in health education sessions to complement the findings of study. The data were thoroughly cleaned and entered into MS-Excel spread sheets, and analysis was carried out. The procedures involved were transcription, preliminary data inspection, content analysis, and interpretation. Percentages were used in this study to analyze epidemiological variables. In our present study, the duration of the swelling of the study population extended from 7 days to 18 years. In most of the cases, it ranges from 6 months to 3 years. The average size of the goiter was 2.8 cm and most of the patients presents as solitary thyroid nodule. The highest incidence of thyroid swelling (75.84%) in our study was found among the study population in the age group of 20-40 years. The youngest patient in out study group was of nine years and the oldest patient was a male of 59 years. In the present series female outnumbered male by a ratio of 4:1 [Table 1]. It was noted that 166 (93.2%) patients sought medical advice because of the swelling in front of the neck. 35 (19.7%) patients also had pain in the swelling. Difficulty in swallowing and breathing was complained by 23 (12.9) and 18(10.1%) of the patients respectively. Pain with fever was the complaint for 12 (6.7) patients and change of voice was the complaint of 6 (3.3%) patients [Table 2]. In our present study, it was observed that 43.3% of the patients had swelling in the right lobe followed by 19.7% in the left lobe of the thyroid gland. It was observed that majority of the swelling (66.8%) was of firm consistency followed by hard (16.9%), soft (13.3%), and cystic (3.3%) [Table 3]. The present study shows that 90% of the cases had euthyroid status. Hypothyroidism and hyperthyroidism were observed in 6.7% and 3.3% of the cases respectively [Table 4]. Only cases diagnosed with colloid goiter had various forms of surgery. 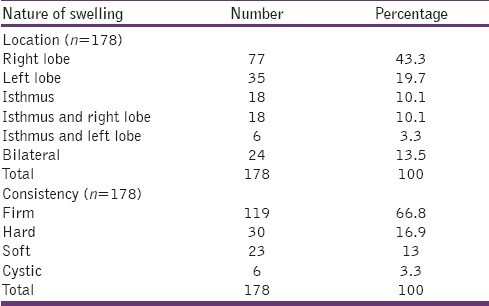 Otherwise, majority were subjected to hemithyroidectomy (51.5%) [Table 5]. Strength of our study lies in conducting all relevant investigations at the out patients department to increase patient compliance. With the advent and improvement of FNAC, we were able to have an improved understanding of the pathology of thyroid disease preoperatively. This also helped in subsequent management in a better approach. Moreover, as all the patients were from poor socio-economic background, they were given a therapy of maximum surgical ablation keeping in mind the fact that they may not routinely come up for follow up. None of the cases in our present series developed any postoperative complications including recurrent laryngeal nerve palsy, hypoparathyroidism, hypothyroidism or thyroid crisis (storm). Lastly, an attempt has been made to strike a balance between adequacy of therapy on one hand and morbidity and cost of lifelong substitution therapy associated with total thyroidectomy on the other. We had several limitations. Firstly, ultrasonography was not done regularly except in one case where a thyroid swelling was associated with vascular malformation. Secondly, we had not done isotope scan scintigraphy as the facility was not available at our centre. Thirdly, we did not have facilities for frozen section analyses and the radio iodine ablation postoperatively. With all these constraints our surgical management was guided entirely by FNAC report and clinical acumen. To sum up, a vast majority of operations for solitary nodules are performed in benign nodules. The identification of malignant thyroid swelling amidst numerous benign or apparently benign goitres has always been a problematic part for the clinicians as well as for the cytologists. Fortunately most carcinomas of the thyroid swelling can be readily diagnosed by battery of investigations available. 1. Polyzos SA, Kita M, Avramidis A. Thyroid nodules - stepwise diagnosis and management. Hormones (Athens) 2007;6:101-19. 2. Hegedus L. Clinical practice. The thyroid nodule. N Engl J Med 2004;351:1764-71. 3. Lin JD, Chao TC, Huang BY, Chen ST, Chang HY, Hsueh C. Thyroid cancer in the thyroid nodules evaluated by ultrasonography and fine-needle aspiration cytology. Thyroid 2005;15:708-17. 4. Gharib H, Goellner JR. Fine-needle aspiration biopsy of the thyroid: An appraisal. Ann Intern Med 1993;18:282-9. 5. Kim WB, Han SM, Kim TY, Nam-Goong IS, Gong G, Lee HK, et al. Ultrasonographic screening for detection of thyroid cancer in patients with Graves' disease. Clin Endocrinol (Oxf) 2004;60:719-25. 6. Ortiz R, Hupart KH, DeFesi CR, Surks MI. Effect of early referral to an endocrinologist on efficiency and cost of evaluation and development of treatment plan in patients with thyroid nodules. J Clin Endocrinol Metab 1998;83:3803-7. 7. Franklyn JA, Daykin J, Young J, Oates GD, Sheppard MC. Fine needle aspiration cytology in diffuse or multinodular goitre compared with solitary thyroid nodules. BMJ 1993;307:240-4. 8. Tollin SR, Mery GM, Jelveh N, Fallon EF, Mikhail M, Blumenfeld W, et al. The use of fine-needle aspiration biopsy under ultrasound guidance to assess the risk of malignancy in patients with a multinodular goiter. Thyroid 2000;10:235-41. 9. Gandolfi PP, Frisina A, Raffa M, Renda F, Rocchetti O, Ruggeri C, et al. The incidence of thyroid carcinoma in multinodular goiter: Retrospective analysis. Acta Biomed 2004;75:114-7. 10. Marqusee E, Benson CB, Frates MC, Doubilet PM, Larsen PR, Cibas ES, et al. Usefulness of ultrasonography in the management of nodular thyroid disease. Ann Intern Med 2000;133:696-700. 11. Pacini F, Schlumberger M, Dralle H, Elisei R, Smit JW, Wiersinga W. European consensus for the management of patients with differentiated thyroid carcinoma of the follicular epithelium. Eur J Endocrinol 2006;154:787-803. 12. Psarras A, Papadopoulos SN, Livadas D, Pharmakiotis AD, Koutras DA. The single thyroid nodule. Br J Surg 1972;59:545-8. 13. Kapur MM, Sarin R, Karmakar MG, Sarda AK. Solitary thyroid nodule. Ind J Surg 1982;44:174-9. 14. Hamming JF, Goslings BM, van Steenis GJ, van Ravenswaay Claasen H, Hermans J, van de Velde CJ. The value of fine-needle aspiration biopsy in patients with nodular thyroid disease divided into groups of suspicion of malignant neoplasms on clinical grounds. Arch Intern Med 1990;150:113-6. 15. Caruso D, Mazzaferri EL. Fine needle aspiration biopsy in the management of thyroid nodules. Endocrinologist 1991;1:194-202. 16. Bhansali SK. Solitary nodule in the thyroid gland; experience with 600 cases. Ind J Surg 1982;44:547-61. 17. Ananthakrishnan N, Rao KM, Narasimhan R, Veliath AJ. The single thyroid nodule - A South Indian Profile of 503 patients with special reference to incidence of malignancy. Ind J Surg 1993;55:487-92. 18. Rao AS, Rao KS. Solitary nodules in the thyroid. Ind J Surg 1971;33:44-51. 19. Anderson JB, Webb AJ. Fine Needle aspiration biopsy and the diagnosis of thyroid cancer. Br J Surg 1987;74:292-6. 20. Hanson GA, Komorowski RA, Cerletty JM, Wilson SD. Thyroid gland morphology in young adults: Normal subjects versus those with prior low-dose neck irradiation in childhood. Surgery 1983;94:984-8. 21. Satran L, Sklar C, Dehner L, Kim T, Nesbit M. Thyroid neoplasm after high-dose radiotherapy. Am J Pediatr Hematol Oncol 1983;5:307-9. 22. Amesur NR, Roy HG, Gill RK. Thyroid Swelling (A review of seventy-five consecutive cases of thyroids, with special reference to its incidence, malignancy and post-operative complications). Ind J Surg 1963;25:621-34. 23. Russel CFJ. The management of the solitary thyroid nodule. In: Johnson CD, Taylor I, editors. Recent advances in surgery. Vol. 17. London: Churchill-Livingstone; 1994. p. 4-16. 24. Kaplan EL, Sugimoto J, Yang H, Fredland A. Postoperative hypoparathyroidism: Diagnosis and management. Surgery of the Thyroid and Parathyroid Glands. In: Kaplan, EL, editor. New York: Churchill Livingstone; 1983. p. 262-74. 25. Gangadharan P, Nair MK, Pradeep VM. Thyroid cancer in Kerala. In: Shah AH, Samuel AM, Rao RS, editors. Thyroid Cancer- An Indian Perspective. Mumbai: Quest Publications; 1999. p. 17-32. 26. Kumar KV. Thyroid Cancer Indian Experience. KIMIO 1997; p. 157-61. 27. Carroll BA. Asymptomatic thyroid nodules: Incidental sonographic detection. Am J Roentgenol 1982;138:499-501. 28. Brander A, Viikinkoski P, Nickels J, Kivisaari L. Thyroid gland: US screening in a random adult population. Radiology 1991;181:683-7. 29. Ezzat S, Sarti DA, Cain DR, Braunstein GD. Thyroid incidentalomas. Prevalence by palpation and ultrasonography. Arch Intern Med 1994;154:1838-40. 30. Tan GH, Gharib H. Thyroid incidentalomas: Management approaches to nonpalpable nodules discovered incidentally on thyroid imaging. Ann Intern Med 1997;126:226-31. 31. Belfiore A, Giuffrida D, La Rosa GL, Ippolito O, Russo G, Fiumara A, et al. High frequency of cancer in cold thyroid nodules occurring at young age. Acta Endocrinol (Copenh) 1989;121:197-202. 32. Crile G, Dempsey WS. Indications for removal of non-toxic nodular goiters. JAMA 1949;139:1247-51. 33. Kendall LW, Condon RE. Prediction of malignancy in solitary thyroid nodules. Lancet 1969;1:1071-3. 34. McConahey WM. Papillary thyroid carcinoma treated at the Mayo Clinic 1946-1970: Initial manifestations, pathologic findings, therapy and outcome. Mayo Clin Proc 1986;61:978-96. 35. Taylor S. The solitary thyroid nodule. J R Coll Surg Edinb 1969;14:267-71. 36. Farling PA. Thyroid disease. Br J Anaesth 2000;85:15-28.